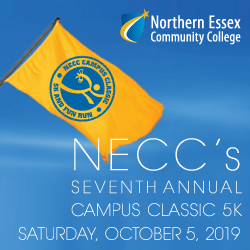 The NECC Campus Classic 5K has something for everyone. Participants can run or walk the USATF-certified 5K course through NECC’s picturesque Haverhill Campus and surrounding neighborhoods, cheer on their friends as they race to the finish line, or enjoy any number of activities and programs that will be available on campus throughout the morning. If you are a proud college graduate or current student, you are encouraged to wear apparel from your college as you run or walk.